I’m afraid my good friend Jan is off the mark in her last comment. 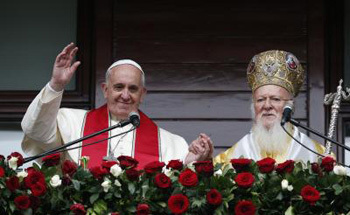 The actions of Francis in Turkey are not novelties; they are replays of scenes made by Benedict and John Paul II. Francis is simply following in the footsteps of his predecessors, albeit with more extravagance and boldness. Let me briefly review a few of these shocking incidents Jan mentioned. “On that we are agreed,” replied Francis. Later he called it a beautiful moment of dialogue. Yes, indeed, all very shocking. But Jan is wrong to think that such things never happened under the supposedly conservative Pope Ratzinger. 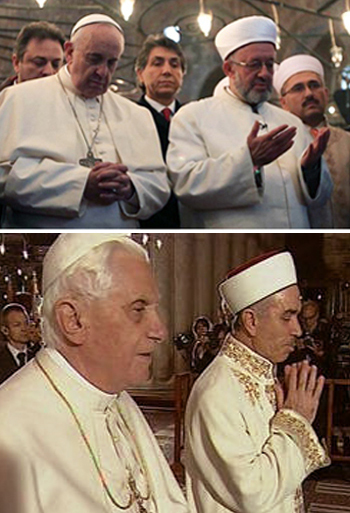 As the media was quick to point out, Francis’ prayer at the Blue Mosque mirrored Benedict XVI’s. The innovation was Francis’ brazen, unabashed request for prayer. 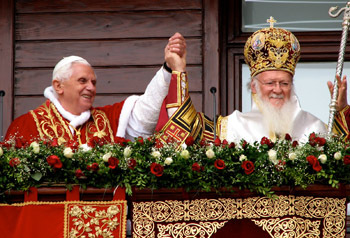 In fact, Benedict XVI did much the same thing on his visit to Turkey on November 30, 2006 – eight years ago. On that date, he fixed the example that Francis would imitate. Before entering the Blue Mosque, Benedict removed his shoes to not offend Muslim sensibilities, took instructions from the mustafa on how to pray, then, turned toward the direction of Mecca and silently prayed with the Muslims. Let me insert here that the first Pope to visit a mosque was John Paul II. On his second trip to the Middle East in 2001, JPII entered a mosque in Damascus. Before entering, he removed his shoes and put on white slippers to follow the Muslim custom. Then, before the shrine of St. John the Baptist, he paused in silent prayer. The precedent was set. It is another very sad fact, but there is nothing novel about Francis’ prayer at the Blue Mosque: He was simply following the official hermeneutics of rupture set by his two predecessors. I suggest you read the main initiatives that the conciliar Popes have made to completely change the face of the Catholic Church here. We have seen so many pictures of post-conciliar Popes embracing schismatic patriarchs that it is hardly even news. During his long pontificate, Wojtyla followed that road, embracing schismatics at every turn. In 1999, he visited Romania and hugged patriarch Teoctist, assisted at a schismatic worship service, and later signed a joint statement calling for peace. The same year, he embraced the patriarch of Constantinople and attended a schismatic liturgy there. In 2001, he went to Greece to embrace schismatic Christodoulos and publicly apologized for alleged “offenses” of the Catholic Church against the schismatics. Then, in Bulgaria he embraced its schismatic patriarch. The list goes on and on. To inaugurate the year of St. Paul in 2008, we find Benedict celebrating the feast of the apostles Peter and Paul together with Bartholomew in the Vatican. Given these antecedents, it was hardly news when, on Francis’ visit to Turkey, he embraced Bartholomew, celebrated a schismatic service alongside him in the Church of St. George, and signed another joint statement urging peace. Now, Francis, who likes to shock and make headlines, obviously had to do something more. 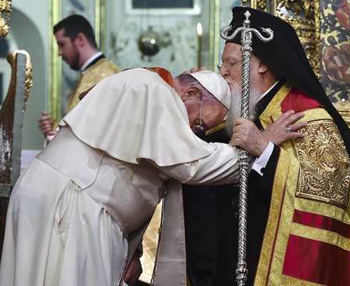 So, at the end of the joint prayer service Saturday evening, he bowed before Bartholomew and said he wanted to ask a favor: “To bless me and the Church of Rome.” The patriarch obliged, planting a kiss on Francis’ bowed head. This shameful display of deference to the schismatic leader and the ridiculous way Bergoglio performed it were the only novelties in the Pope’s meeting with the schismatic. I conclude saying that, although mistaken regarding her nostalgia for Benedict, my friend Jan was right in several of her evaluations. There really seemed to be no point to the trip to Turkey other than a dizzying display of ecumenical and inter-religious gestures. Francis was innovative in his extravagant gestures that were intended to draw attention to himself in events that have become commonplace. It is in those inter-religious services and ecumenical embraces with schismatics that we find implicitly the heresy of universal salvation professed by all the conciliar Popes. These acts contradict the constant teaching of the Catholic Church before Vatican II, as my friend Jan can read in many places in the TIA section on Forgotten Truths. In face of such heresy – not just of the flamboyant Francis but also of his predecessors Paul VI, John Paul II and Benedict – faithful Catholics cannot just remain silent. Nor can they follow the proud path of sede-vacantism. The position Catholics can and must take, is the position of resistance “against the teachings of Vatican Council II and the post-Conciliar Pope that are objectively opposed to the prior ordinary and extraordinary Papal Magisterium” (Resistance Statement in We Resist You to the Face, Los Angeles: TIA, 2000). I suggest my friend Jan to read that increasingly timely statement. It is addressed to John Paul II, but applies interchangeably to Popes Ratzinger and Bergoglio.